3.1.1.10 The following principles of accounting and financial reporting are based on those set forth in the Governmental Accounting Standards Board’s (GASB) Codification of Governmental Accounting and Financial Reporting Standards. The BARS manual permits accounting and financial reporting that conforms to these principles in all respects and requires GAAP municipalities to account and report in conformity with these principles, except that the annual report required is not as extensive as the Comprehensive Annual Financial Report (CAFR). A governmental accounting system must make it possible both: (a) to present fairly and with full disclosure the funds and activities at the government in conformity with generally accepted accounting principles; and (b) to determine and demonstrate compliance with finance-related legal and contractual provisions. A governmental accounting system should be organized and operated on a fund basis. A fund is defined as a fiscal and accounting entity with a self-balancing set of accounts recording cash and other financial resources, together with all related liabilities and residual equities or balances, and changes therein, which are segregated for the purpose of carrying on specific activities or attaining certain objectives in accordance with special regulations, restrictions, or limitations. Fund financial statements should be used to report detailed information about primary government, including its blended component units. The focus of governmental and proprietary fund financial statements is on major funds. In fund financial statements, governments should report governmental, proprietary, and fiduciary funds to the extent that they have activities that meet the criteria for using these funds. Presented below is a system to classify all funds used by local government and the assignment of code numbers to identify each type of fund. A three digit code is used: the first digit identifies the fund type and the next two digits will be assigned by the governmental unit to identify each specific fund. General (Current Expense) Fund – should be used to account for and report all financial resources not accounted for and reported in another fund. Although a local government has to report only one general fund in its external financial reports, the government can have multiple general subfunds for its internal managerial purposes. These managerial subfunds have to be combined into one general fund for external financial reporting. Special Revenue Funds – should be used to account for and report the proceeds of specific revenue sources that are restricted or committed to expenditure for specific purposes other than debt service or capital projects. Restricted revenues are resources externally restricted by creditors, grantors, contributors or laws or regulations of other governments or restricted by law through constitutional provisions or enabling legislation (similar to restricted component of net position used in government-wide reporting). Committed revenues are resources with limitations imposed by the highest level of the government, and where the limitations can be removed only by a similar action of the same governing body. Revenues do not include other financing sources (long-term debt, transfers, etc.). The term proceeds of specific revenue sources establishes that one or more specific restricted or committed revenues should be foundation for a special revenue fund. They should be expected to continue to comprise a substantial portion of the inflows reported in the fund. While GASB Statement 54 has not provided a numeric range for substantial portion of inflows, it was recommended that at least 20 percent is a reasonable limit for reporting a special revenue fund. Local governments need to consider factors such as past resource history, future resource expectations and unusual current year inflows such as debt proceeds in their analysis. They may use the calculation below to determine whether an activity would qualify for reporting as a special revenue fund. Other resources (investment earnings and transfers from other funds, etc.) also may be reported in the fund if these resources are restricted, committed, or assigned to the specific purpose of the fund. Governments should discontinue reporting a special revenue fund, and instead report the fund’s remaining resources in the general fund, if the government no longer expects that a substantial portion of the inflows will derive from restricted or committed revenue sources. The Statement requires all revenue to be recognized in the special revenue fund. If the resources are initially received in another fund, such as the general fund, and subsequently remitted to a special revenue fund, they should not be recognized as revenue in the fund initially receiving them. They should be recognized as revenue in the special revenue fund from which they will be expended. So, the local governments can either receive resources directly into the special revenue fund, or account for the resources as agency deposits in the receiving fund and, after remitting them, recognize them as revenue to the special revenue fund. Special revenue funds should not be used to account for resources held in trust for individuals, private organizations, or other governments. The general fund of a blended component unit should be reported as a special revenue fund. The state statutes contain many requirements for special funds to account for different activities. The legally required funds do not always meet GAAP standards for external reporting. So, while the local governments are required to follow their legal requirements, they will have to make some adjustment to their fund structure for external financial reporting. Debt Service Funds – should be used to account for and report financial resources that are restricted, committed, or assigned to expenditure for principal and interest. Debt service funds should be used to report resources if legally mandated. Financial resources that are being accumulated for principal and interest maturing in future years also should be reported in debt service funds. The debt service transactions for a special assessment for which the government is not obligated in any matter should be reported in an agency fund. Also, if the government is authorized, or required to establish and maintain a special assessment bond reserve, guaranty, or sinking fund, GASB Statement 6 requires using a debt service fund for this purpose. Capital Projects Funds – should be used to account for and report financial resources that are restricted, committed, or assigned to expenditure for capital outlays including the acquisition or construction of capital facilities or other capital assets. Capital outlays financed from general obligation bond proceeds should be accounted for through a capital projects fund. Capital project funds exclude those types of capital-related outflows financed by proprietary funds or for assets that will be held in trust for individuals, private organizations, or other governments (private-purpose trust funds). Permanent Funds – should be used to account for and report resources that are restricted to the extent that only earnings, and not principal, may be used for purposes that support the reporting government’s programs – that is for the benefit of the government or its citizens (public-purpose). Permanent funds do not include private-purpose trust funds which account for resources held in trust for individuals, private organizations, or other governments. Debt backed solely by a pledge of the net revenues from fees and charges. Legal requirement to recover cost. An enterprise fund is required to be used if the cost of providing services for an activity including capital costs (such as depreciation or debt service) must be legally recovered through fees or charges. Policy decision to recover cost. It is necessary to use an enterprise fund if the government’s policy is to establish activity fees or charges designed to recover the cost, including capital costs (such as depreciation or debt service). These criteria should be applied in the context of the activity’s principal revenue source. The term activity generally refers to programs and services. This term is not synonymous with fund. As a practical consequence, if an activity reported as a separate fund meets any of the three criteria, it should be an enterprise fund. Also, if a “multiple activity” fund (e.g., general fund) includes a significant activity whose principal revenue source meets any of these three criteria, the activity should be reclassified as an enterprise fund. The determination of an activity’s principal revenue source is a matter of professional judgement. A good indicator of the activity’s significance may be comparing pledged revenues or fees and charges to total revenue. For example, consider a county auditor’s office that charges fees to provide a payroll service to various taxing districts. Even if the fee is meant to cover the cost of the service, the county auditor function as a whole is primarily supported with tax dollars from the general fund. It would be allowable in this case to leave the activity all within general fund. Finding an appropriate fund type requires a careful analysis since there is not always a clear choice. For example, building permit fees may be accounted for in the general fund or a special revenue fund in certain circumstances, such as when they are partially supported by taxes. However, if there is a pricing policy to recover the cost of issuing those individual building permits, they should be reported in an enterprise fund. In addition, GAAP mandate the use of enterprise funds for the separately issued financial statement of public-entity risk pools. Public-entity risk pools also are accounted for as enterprise funds when they are included within a sponsoring government’s report, provided the sponsor is not the predominant participant in the arrangement. Otherwise, they can use the general fund. Internal Service Funds – may be used to report any activity that provides goods or services to other funds, departments or agencies of the government, or to other governments, on a cost-reimbursement basis. Internal service funds should be used only if the reporting government is the predominant participant in the activity. Otherwise, the activity should be reported in an enterprise fund. Note: The new definitions of fiduciary funds per GASBS 84, Fiduciary Activities are required for reporting fiduciary activities in FY 2019 (i.e., reports submitted in 2020). Additional information regarding these changes is available here. Fiduciary Funds – should be used to account for assets held by a government in a trustee capacity or as a custodian for individuals, private organizations, other governmental units, and/or other funds. These include (a) investment trust funds, (b) pension (and other employee benefit) trust funds, (c) private-purpose trust funds, and (d) custodial funds. Investment Trust Funds – should be used to report fiduciary activities from the external portion of investment pools and individual investment accounts that are held in a trust that meets the following criteria: the assets are (a) administered through a trust in which the government itself is not a beneficiary, (b) dedicated to providing benefits to recipients in accordance with the benefit terms, and (c) legally protected from the creditors of the government. Pension plans and OPEB plans that are administered through trusts that meet the criteria in paragraphs 3 of GASB Statement 67 or paragraph 3 of GASB Statement 74, respectively. Other employee benefit plans for which (1) resources are held in trust that meets the following criteria: the assets are (a) administered through a trust in which the government itself is not a beneficiary, (b) dedicated to providing benefits to recipients in accordance with the benefit terms, and (c) legally protected from the creditors of the government and (2) contributions to the trust and earnings on these contributions are irrevocable. Private-Purpose Trust Funds – should be used to report all fiduciary activities that (a) are not required to be reported in pension (and other employee benefit) trust funds or investment trust funds, and (b) are held in a trust that meets the following criteria: the assets are (a) administered through a trust in which the government itself is not a beneficiary, (b) dedicated to providing benefits to recipients in accordance with the benefit terms, and (c) legally protected from the creditors of the government. Custodial Funds – should be used to report all fiduciary activities that are not required to be reported in pension (and other employee benefit) trust funds, investment trust funds or private purpose trust funds. The external portion of the investment pools that are not held in trust that meets criteria listed above should be reported in a separate external investment pool fund column under the custodial funds classification. External Investment Pool Fund – The external portion of the investment pools that are not held in trust and meet criteria listed above. Although this is consider a custodial fund, it should be reported in a separate external investment pool fund column under the custodial funds classification. NOTE: The custodial funds are required to be used by business-type activities and enterprise funds, if the assets, upon receipt, are normally expected to be held for more than three months. Governments should establish and maintain those funds required by law and sound financial administration. Only the minimum number of funds consistent with legal and operating requirements should be established. Using numerous funds results in inflexibility, undue complexity and inefficient financial administration. Local governments should periodically undertake a comprehensive evaluation of their fund structure to ensure that individual funds that became superfluous are eliminated from accounting and reporting. Elected officials should be educated to the fact that accountability may be achieved effectively and efficiently by judicious use of department, program and other available account coding or cautious use of managerial (internal) funds. A clear distinction should be made between general capital assets and capital assets of proprietary and fiduciary funds. Capital assets of proprietary funds should be reported in both the government-wide and fund financial statements. Capital assets of fiduciary funds should be reported only in the statement of fiduciary net position. All other capital assets of the government are general capital assets. They should not be reported as assets in governmental funds but should be reported in the governmental activities column in the government-wide statement of net position. The Capital Assets (3.3.9 - 3.3.11) sections of the BARS manual provide additional information regarding accounting and reporting of capital assets. A clear distinction should be made between fund long-term liabilities and general long-term liabilities. Long-term liabilities directly related to and expected to be paid from proprietary funds should be reported in the proprietary fund statement of net position and in the government-wide statement of net position. Long-term liabilities directly related to and expected to be paid from fiduciary funds should be reported in the statement of fiduciary net position. All other unmatured general long-term liabilities of the governmental unit should not be reported in governmental funds but should be reported in the governmental activities column in the government-wide statement of net position. The government-wide statement of net position and statement of activities should be prepared using the economic resources measurement focus and the accrual basis of accounting. Revenues, expenses, gains, losses, assets, and liabilities resulting from exchange and exchange-like transactions should be recognized when the exchange takes place. Revenues, expenses, assets, and liabilities resulting from nonexchange transactions should be recognized in accordance with the GASB Statements 24 and 33. In fund financial statements, the modified accrual or accrual basis of accounting, as appropriate, should be used in measuring financial position and operating results. a. Financial statements for governmental funds should be presented using the current financial resources measurement focus and the modified accrual basis of accounting. Revenues should be recognized in the accounting period in which they become available and measurable. Expenditures should be recognized in the accounting period in which the fund liability is incurred, if measurable, except for unmatured interest on general long-term liabilities, which should be recognized when due. b. Proprietary fund statements of net position and revenues, expenses, and changes in fund net position should be presented using the economic resources measurement focus and the accrual basis of accounting. c. Financial statements of fiduciary funds should be reported using the economic resources measurement focus and the accrual basis of accounting, except for the recognition of certain liabilities of defined benefit pension plans and certain postemployment healthcare plans. d. Transfers should be reported in the accounting period in which the interfund receivable and payable arise. a. An annual/biennial budget should be adopted by every government. b. The accounting system should provide the basis for appropriate budgetary control. c. Budgetary comparison schedules should be presented as required supplementary information for the general fund and for each major special revenue fund that has a legally adopted annual/biennial budget. The budgetary comparison schedule should present both (a) the original and (b) the final appropriated budgets for the reporting period ad well as (c) actual inflows, outflows, and balances, stated on the government’s budgetary basis. a. Transfers should be classified separately from revenues and expenditures or expenses in the basic financial statements. b. Proceeds of general long-term debt issues should be classified separately from revenues and expenditures in the governmental fund financial statements. c. Governmental fund revenues should be classified by fund and source. Expenditures should be classified by fund, function (or program), organization unit, activity, character, and principal classes of objects. d. Proprietary fund revenues should be reported by major sources, and expenses should be classified in essentially the same manner as those of similar business organizations, functions, or activities. Activities accounted for in governmental funds by function, to coincide with the level of detail required in the governmental fund statement of revenues, expenditures, and changes in fund balances. Activities accounted for in enterprise funds by different identifiable activities. A common terminology and classification should be used consistently throughout the budget, the accounts, and the financial reports of each fund. (1) Management’s discussion and analysis (MD&A). Notes to the financial statements. (3) Required supplementary information (RSI) other than MD&A. (4) Required supplementary information (RSI) other than MD&A, if applicable. b. The statements and reports listed above follow national standards of financial reporting. They should not be confused with legal reporting requirements, which are prescribed by the State Auditor’s Office for all local governments in Washington State. The legal requirements are consistent with these national standards, but they are not identical. Specific legal reporting requirements are contained in reporting part of this Manual. 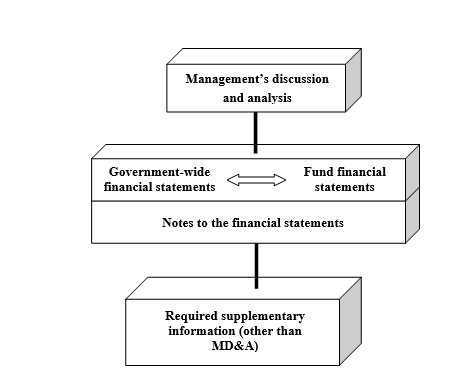 c. A comprehensive annual financial report may be prepared and published, covering all activities of the primary government (including its blended component units) and providing an overview of all discretely presented component units of the reporting entity including introductory section, management's discussion and analysis (MD&A), basic financial statements, required supplementary information other than MD&A, combining and individual fund statements, schedules, narrative explanations, and statistical section. The reporting entity is the primary government (including its blended component units) and all discretely presented component units. d. The financial reporting entity consists of (1) the primary government, (2) organizations for which the primary government is financially accountable, and (3) other organizations for which the nature and significance of their relationship with the primary government are such that exclusion would cause the reporting entity’ basic financial statements to be misleading or incomplete. The reporting entity's government-wide financial statements should display information about the reporting government as a whole distinguishing between the total primary government and its discretely presented component units as well as between the primary government's governmental and business-type activities. The reporting entity’s fund financial statements should present the primary government's (including its blended component units, which are, in substance, part of the primary government) major funds individually and nonmajor funds in the aggregate. Funds and component units that are fiduciary in nature should be reported only in the statements of fiduciary net position and changes in fiduciary net position. e. The nucleus of a financial reporting entity usually is a primary government. However, a governmental organization other than a primary government (such as a component unit, joint venture, jointly governed organization, or other stand-alone government) serves as the nucleus for its own reporting entity when it issues separate financial statements. For all of these entities, the provisions the GASB Statement 14 should be applied in layers from the bottom up. At each layer, the definition and display provisions should be applied before the layer is included in the financial statements of the next level of the reporting government. 4.1.1.10 The requirements for financial reporting in accordance with generally accepted accounting principles (GAAP) are established by the Governmental Accounting Standards Board (GASB) in the GASB Statement 34, Basic Financial Statements – and Management’s Discussion and Analysis – for State and Local Governments. The following diagram illustrates the minimum requirements for general purpose external financial reports. 4.1.1.20 Comparative financial statements mean two complete sets of financial statements for each comparative year. Each set should contain basic financial statements (including notes) and RSI (including MD&A). Both years may be combined in one presentation; however, each element (MD&A, basic financial statements, notes and RSI) have to include information for both years. 4.1.1.30 MD&A should introduce the basic financial statements and provide an analytical overview of the local government’s financial activities. It is part of the Required Supplementary Information (RSI), however it should be presented before the basic financial statements. The MD&A should provide an objective and easily readable analysis of the local government’s financial activities. It should include comparisons of current year to the prior year based on the government-wide information. It also includes information regarding the local government budget variances, capital assets, long-term debt activity, and a description of currently known facts, decisions, or conditions expected to have a significant effect on financial position or results of operations. 4.1.1.40 The government-wide financial statements consist of a statement of net position and a statement of activities. They are prepared using the economic resources measurement focus and the accrual basis of accounting. Each statement distinguishes between the governmental and business-type activities of the primary government and its discretely presented component units. 4.1.1.50 The statement of net position presents the local government as one economic unit rather than a compilation of different funds. The statement focuses on type of activities, rather than type of funds. Local governments should report all capital assets, including infrastructure assets in the government-wide statement of net position. The net position should be reported in three categories: net investment in capital assets, restricted and unrestricted. 4.1.1.60 The statement of activities is a report on the results of the local government’s operations. The statement presents the cost of each function and the extent to which each of the local government’s functions, programs or services either contributes to or takes away from the local government’s general revenue. How the local government finances its activities. 4.1.1.70 Governmental funds should be reported using the current financial resources measurement focus and the modified accrual basis of accounting. These funds are presented by general fund; major funds, and aggregated nonmajor funds. 4.1.1.80 The statement of revenues, expenditures and changes in fund balance reports information about the inflows, outflows, and balances of current financial resources of each major governmental fund and for the nonmajor governmental funds in the aggregate. 4.1.1.90 Each statement reports separate columns for the general fund and for other major governmental and enterprise funds. Major funds are funds whose revenues, expenditures/expenses, assets, or liabilities (excluding extraordinary items) are at least 10 percent of corresponding element totals for all funds of that category or type and at least five percent of the corresponding element total for all governmental or enterprise funds combined. The local government may choose to report any other funds as a major fund if they believe they are important to users. The nonmajor funds are reported in aggregate in a separate column. 4.1.1.110 Proprietary funds continue to be presented on the economic resources measurement focus and the full accrual basis of accounting. Proprietary funds are reported the same way as in the government-wide financial statements. However, internal service funds should be reported as a fund type (aggregated) in a separate column. Major enterprise funds are reported in separate columns and nonmajor enterprise funds are aggregated in a single column. 4.1.1.120 The proprietary statement of net position presents assets and liabilities in a classified format. Restricted assets are reported separately. Net position should be reported in the following three components: net investment in capital assets, restricted and unrestricted. 4.1.1.130 The proprietary statement of revenues, expenses, and changes in fund net position reports in a specific format prescribed by the GASB Statement 34. All transactions that affect net position are included. Revenues are reported by major source. Expenses are reported by either detail (object) or function level. Revenues and expenses should distinguish between operating and nonoperating. Statement of Changes in Fiduciary Net Position. The fiduciary statements are prepared using the economic resources measurement focus and full accrual basis of accounting (with some exceptions for liabilities for defined benefit pension plans and certain postemployment health care plans). 4.1.1.160 The statement of fiduciary net position should include information about the assets, liabilities, and net position for each fiduciary fund type and for similarly discretely presented component units of the reporting entity. The local government should provide details for all other fiduciary funds, or clearly indicate where the information is displayed. 4.1.1.170 The statement of changes in fiduciary net position should include information about the additions to, deductions from, and net increase (or decrease) for the year in net position for each fiduciary fund type and similar discretely presented component units. It should provide information about significant year-to-year changes in net position. The local government should provide additional details about investments and provide the level of details for all other fiduciary funds or clearly indicate where the information is displayed. 4.1.1.180 Notes to the financial statements are essential to fair presentation of the basic financial statements. The notes include the summary of significant accounting policies and summary disclosure of such matters as significant contingent liabilities, encumbrances outstanding, significant effects of subsequent events, pension plans, accumulated unpaid employee benefits (such as vacation and sick leave), material violations of finance-related legal and contractual provisions, debt service requirements to maturity, commitments under noncapitalized leases, construction and other significant commitments, any excess of expenditures over appropriations in individual funds, deficit balances of individual funds, and interfund receivables and payables. Any other disclosures necessary in the circumstances should also be included. The NCGA has discussed the notes to financial statements in more detail in its Interpretation 6, which also provides guidance for presenting notes in a logical order. 4.1.1.190 Statements, schedules, statistical data, and other information the GASB deem necessary is reported as required supplementary information (RSI). Except for the MD&A, required supplementary information, including the budgetary comparison information, should be presented immediately following the notes to the financial statements. Revenue and claims development trend data (for public-entity risk pools). 4.1.1.200 In June 1991, GASB issued the Statement 14, The Reporting Entity, which is effective for financial statements for periods beginning after December 15, 1992. Statement 14 establishes standards for defining and reporting on the financial reporting entity and applies to financial reporting by primary governments, as well as to separately issued financial statements of governmental component units. The Statement 14 defines the financial reporting entity as consisting of (1) the primary government, (2) organizations for which the primary government is financially accountable and (3) other organizations for which the nature and significance of their relationship with the primary government are such that exclusion would cause the reporting entity’s financial statements to be misleading or incomplete. 4.1.1.210 A primary government is financially accountable for those organizations that make up its legal entity as well as legally separate organizations if the primary government appoints a voting majority of an organization’s governing body, and either it can impose its will on that organization or there is a potential for the organization to provide specific financial benefits to, or to impose specific financial burdens on, the primary government. 4.1.1.220 Most organizations determined to be component units under the Statement 14 should be included in the financial reporting entity by discrete presentation – that is, by presentation in one or more columns separate from the financial data of the primary government. However, some component units may, in substance, be the same as the primary government and should be reported as part of the reporting entity – that is, the component unit’s balances and transactions are reported in a manner similar to those of the primary government, by blending. It is likely that an organization considered to be a component unit under existing standards and blended will continue to be considered a component unit under the Statement 14; however, according to the Statement 14, that component unit will probably be reported by discrete presentation. The following flowchart will help to determine the reporting status of an organization. Refer to the Statement’s Glossary for definitions of the various terms. 4.1.1.230 In September 2006, GASB issued the Statement 48, Sales and Pledges of Receivables and Future Revenues and Intra-Entity Transfers of Assets and Future Revenues. This Statement applies to all intra-entity transactions (sales and donations) that involve the transfer of financial assets, capital assets and future revenues. When accounting for the transfer of capital and financial assets and future revenues within the same financial reporting entity, the transferee should recognize the assets or future revenues received at the carrying value of the transferor. The difference between the amount paid (exclusive of amounts that may be refundable) and the carrying value of the assets transferred should be reported as a gain or loss by the transferor (revenue in governmental funds) and as a revenue or expenditure/expense by the transferee in a separately-issued statements, but reclassified as transfers in the financial statements of the reporting entity. Application of this Statement should be the same for both discretely presented and blended component units. 4.1.1.240 Hospital Districts: The General Accounting Standards Board (GASB) Codification of Governmental Accounting and Financial Reporting Standards, section Ho5.601 supersedes the June 1996 AICPA Audit and Accounting Guide, Health Care Organizations, to the extent of financial reporting. However, the Guide continues to provide guidance on individual transactions that are unique to healthcare organizations. The Guide is considered Category B guidance in the hierarchy of GAAP. 1. An organization has separate legal standing if it is created as a body corporate or a body corporate and politic, or if it otherwise possesses the corporate powers that would distinguish it as being legally separate from the primary government. 2. Corporate powers give an organization the capacity to have a name; the right to sue and be sued in its own name without recourse to another state or local governmental unit; and the right to buy, sell, lease, and mortgage property in its own name. 3. The primary government’s appointment authority should be substantive and continuing. A primary government’s appointment authority is not substantive if the number of candidates is limited by the nominating process or if its responsibility is limited to confirming appointments made by individuals or groups other than the primary government’s officials or appointees. In the absence of continuing appointment authority, the ability of a primary government to unilaterally abolish an organization also provides the basis for ongoing accountability. It is also important to make a distinction between substantive and ministerial (compliance) approval. Ministerial approval is often a result of the general oversight of the respective state or local governments. This may include evaluation of programs, review for compliance with the statutory requirements, etc. Being subject to ministerial approval does not qualify an organization as fiscally dependent. Also, a primary government that is temporarily under the fiscal control of another government continues to be fiscally independent. 5. The benefit or burden relationship may result from legal entitlements or obligations, or it may be less formalized and exist because of a decision made by the primary government or agreements between the primary government and component unit. The primary government is legally entitled to or can otherwise access the organization’s resources. The primary government is legally obligated or has otherwise assumed the obligation to finance deficits of, or provide financial support to, the organization. The primary government is obligated in some manner for the debt of the organization. Exchange transactions between organizations and the primary government are not considered a financial benefit or burden relationship. The effect of the financial benefits or burdens on the primary government can be either direct or indirect. A direct effect occurs when the primary government itself is entitled to the resources or obligated for the deficits or debits of the organization. An indirect relationship occurs when one or more of the primary government’s component units is entitled to the resources and obligated for the deficits or debts of the organization. In both cases, the primary government has the benefit/burden relationship with the organization. The economic resources received or held by the organization are almost entirely for the direct benefit of the primary government, its component units, or its constituents. The primary government is entitles to, or has the ability to otherwise access, a majority of the economic resources received or held by the separate organization. The economic resources received or held by an individual organization that the specific primary government, or its component units, is entitled to, or has the ability to otherwise access, are significant to that primary government. 7. Other organizations should be evaluated as potential component units if they are closely related to or financially integrated with the primary government and included as component units if the nature and significance of their relationship with the primary governments is such that exclusion from the financial reporting entity would render the financial statements incomplete or misleading. It is a matter of professional judgment to determine whether the nature and the significance of a potential component unit’s relationship with the primary government warrant inclusion. The ability to remove the appointed members of the organization’s governing body at will. The ability to modify or approve the budget of the organization. The ability to modify or approve the rate or fee changes affective revenues, such as water usage rate increases. The ability to veto, overrule, or modify the decisions (other than those in b and c) of the organization’s governing body. The ability to appoint, hire, reassign, or dismiss those persons responsible for the day-to-day operations (management) of the organization. There may be other conditions indicating the possibility of imposing will. When assessing them, remember to make the distinction between substantive and ministerial approvals. A potential component unit for which a primary government is financially accountable may be fiscally dependent on another government. An organization should be included as a component unit of only one reporting entity. Professional judgment should be used to determine the most appropriate reporting entity. A primary government that appoints a voting majority of the governing board of a component unit of another government should make the disclosures required for related organizations. 9. A component unit should be presented as blended when the component unit’s governing body is substantively the same as the governing body of the primary government and (1) there is a financial benefit/burden relationship between the primary government and the component unit or (2) management of the primary government has operational responsibility for the component unit. Additionally, a component unit should be included using blending method if the component unit is organized as a not-for-profit corporation in which the primary government is the sole corporate member ( GASB Statement 80, Blending Requirements for Certain Component Units). 10. A component unit should be presented as blended when the component unit provides services entirely, or almost entirely, to the primary government or otherwise exclusively, or almost exclusively, benefits the primary government even though it does not provide services directly to it. The essence of this type of arrangement is much the same as an internal service fund – the goods or services are provided to the government itself rather than to the citizenry. As prescribed in the GASB Statement 85, Omnibus 2017, for a primary government that is a business-type activity and uses a single column for financial statement presentation of its business-type activities, a component unit may be blended only if the component unit meets a criterion for blending in paragraph 53 of the GASB Statement 14, The Financial Reporting Entity. The GASB Statement 14 (as amended by GASB Statements 34, 39, 61 and 80) allows flexibility in displaying the component units’ financial data. Please refer to the matrix in the Manual for a detailed listing of the possible displays for component units. New account for governments collecting sales and use tax as authorized in RCW 82.14.530. Expanded definition to clarify use of this code. Code applicable only to Seattle and King County. Expanded the title and the definition to include internet services as authorized by Chapter 186, Laws of 2018. Revised title and definition to clarify use of this account for pension and OPEB related revenues only. Removed these accounts since the loans are balance sheet transactions and their reporting on Schedule 01 was always optional. The account was divided between internal and external legal services. Within each category were created more separate accounts for different specific legal expenditures. The change will allow governments to analyze and compare costs much more effectively. This also aligns accounting records with procedures auditors are required by professional standards to perform an audit on legal liabilities, so it will help make the audit process more efficient. This change was already announced in 2016 and was not required for the FY 2017 reports; however, the new accounts will be required for 2018 reporting. Object code 50 was removed and the definitions of object codes 30 and 40 adjusted to include the transactions which were previously reported using object 50. For other details see BARS Alert issued August 1, 2018. GASB Statement 84, Fiduciary Activities – the Statement is effective for reporting periods beginning after December 15, 2018; however we incorporated the required changes in this version of manual. The additional information will be available on our website under Fiduciary Funds in BARS manual. The update incorporates the changes to RCW 36.32.210 which removed the annual inventory requirement. The change was communicated on March 21, 2018 in BARS Alert. Clarified and expanded group/composite depreciation section based on research and GASB codification guidance. Removed requirement to capitalize interests during construction. This is an early implementation of GASBS 89, Accounting for Interest Cost Incurred before the End of Construction Period which is applicable for reporting periods beginning after December 15, 2019. Added GASBS 86, Certain Debt Extinguishment Issues update regarding accounting and reporting when the debt is refunded with the government’s own resources. A new section was added to discuss and clarify concepts related to accounting and reporting of contingencies and litigations. The section was updated to reflect the 2018 legislative changes in the amounts of collected surcharges. New section was added regarding Equipment Rental and Revolving (ER&R) Fund. This guidance was previously available outside the BARS manual and it is now incorporated into the manual allowing an easy access. Added a new section to provide a general overview of interfund transactions. GASB Statement 84, Fiduciary Activities – the statement is effective for reporting periods beginning after December 15, 2018; however we incorporated the required changes in this version of manual. The following sections were updated: 4.1.1.150 (removed due to the changes in reporting requirements for custodial funds and they impact on CAFR); 4.1.4.20, 4.3.1.40, 4.3.2.70, 4.8.3.50, and 4.9.140. These changes involved only a title change from the agency to custodial funds. The most significant change involves changes in financial reporting and these are incorporated into 4.3.5, Fiduciary Funds Financial Statements. Added reporting requirements of GASBS 88, Certain Disclosures Related to Debt, Including Direct Borrowings and Direct Placements. This Statement is applicable for reporting periods beginning after June 15, 2018. Added link to the WA State Department of Revenue page containing information regarding state’s abatements. This update was communicated on March 7, 2018 in the BARS Alert. Clarified that the governments should be reporting both short- and long-term liabilities on the Schedule. Also added new ID. Numbers for registered warrants and lines of credits. Remove discussion of ARRA grants. The Schedule was revised to provide relevant information needed in assessing and auditing governments’ risk management circumstances. The Schedule 09, Schedule of Liabilities, includes a new validation check for net pension liabilities. Governments will receive a red flag if they have pension related liabilities but do not report them on the Schedule 09 or if they are using the incorrect ID No. The account was split into two 3981, Insurance Recoveries for cash basis governments and 3985, Insurance Recoveries for GAAP. The split was necessary to accommodate reporting by cash basis proprietary funds since the BARS codes in 370 series are not available to them. The revised account 3985 replaces the original 398 code. Changed title to Depreciation, Depletion, Amortization – Combined Utilities to correctly reflect the RCW. Added new account 50195, Depreciation, Depletion, Amortization – Infrastructure to include depreciation related to parking facilities. These paragraphs were related to capital assets and were removed since the topics are covered extensively in Capital Asset Accounting (3.3.10). The section is no longer needed since we do not prescribe the G.L. accounts. The section was replaced with accounting and reporting for the B&O tax related to utilities (Utility Tax, 3.6.13). Added a flowchart to determine if the expenditures should be capitalized. Clarified in the bullet 2 that the future lease principal payments should be recorded as debt redemption rather than other financing uses. Updated the bullet 2 regarding remaining prepaid insurance (GASBS 86, Certain Debt Extinguishment Issues). The section was revised to better describe the reporting of property tax (no substantive change). The section was revised to provide accounting requirements reflecting the current status of the advances from the DSHS. A new paragraph (3.9.1.30) was added. The paragraph discusses an issue of a government incorrectly using its own debt instruments as investments. Updated the section to include electronic payments. 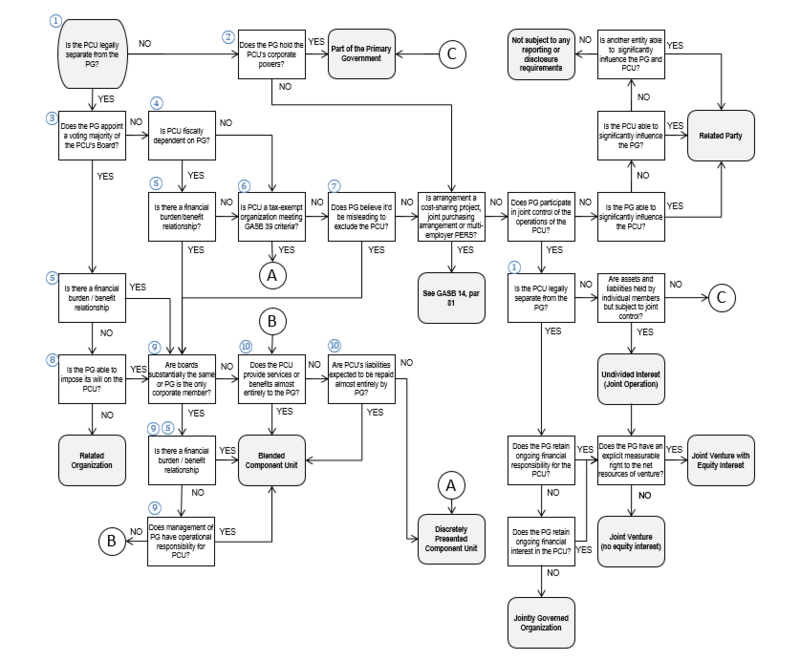 Flowchart and Notes to the Flowchart: The flowchart was updated to incorporate GASBS 80, Blending Requirements for Certain Component Units regarding situation when the government is the sole corporate member. Also, paragraph 12 was updated to incorporate the GASBS 85, Omnibus 2017 regarding blending component units with business-type activities. The matrix of reporting requirements was updated to eliminate reporting Schedules 07 and 11. The Matrix of Statutory Reporting Requirements was updated to eliminate reporting Schedules 07 and 11. A new note was added to meet the disclosure requirements of the GASBS 83, Certain Asset Retirement Obligations. Please note that the requirement is applicable for reporting years starting after June 15, 2018. The note was revised to make the disclosure easier by adding tables and additional samples of text. There are no substantive changes. Added additional instructions for preparers regarding disclosures when the debt is refunded with the government’s own resources. This addition incorporates the GASBS 86, Certain Debt Extinguishment Issues applicable for the year begining after June 15, 2017. Added a matrix to summarize the disclosure requirements for governments’ own abatements and abatements of others. Also added discussion regarding disclosure when, regardless of a tax abatement agreement, the overall tax revenue is not reduced. Added 4.8.3.71 and 4.8.3.81 regarding reporting loans with forgiveness clause. These accounts were combined into 36200, Rents and Leases. This account is designed only for rentals and leases which are not a part of the governments’ principal operation [those rents and leases should be accounted in the appropriate 340s service and sales accounts]. The new section Determining Operating/Nonoperating Revenues/Expenses in Proprietary Funds provides guidance for classification of revenues/expenses as operating/nonoperating for the proprietary funds. The account 388, Prior Period Adjustments was changed to 38810 and account 38850, Cumulative Effect of Change in Accounting Principle(s) was added. These accounts are still optional for GAAP governments. The account 588, Prior Period Adjustments was changed to 58810 and account 58850, Cumulative Effect of Change in Accounting Principle(s) was added. The change applicable to the courts’ deposits and remittances was updated on March 14, 2017. The following BARS Alert was sent to all cities and counties at that time. A new section was added with a guidance regarding classification of revenues/expenses as operating or nonoperating. This section is applicable only to proprietary GAAP funds. It contains a discussion and a spreadsheet showing the BARS classification. The new section should help governments to resolve the discrepancy between operating/nonoperating categories in their financial statements and in the FIT presentation. Capital asset guidance that was previously split into nine different sections (3.3.1 – 3.3.7 and 4.2.5 – 4.2.6) were consolidated into three. While content has not fundamentally changed, most topics were updated and re-written to improve guidance and match the current environment and user needs. In particular, internal control guidance was expanded to help local governments with management of capital assets. The pension section has been updated for the second year of pension reporting. The note was removed. The information required in this note is already provided in other risk management related disclosures. The note was updated to incorporate reporting requirements contained in GASB Statement 72, Fair Value Measurement and Application. Added a new note required when a government participates in a nongovernmental pension plan (GASBS 78). The note instructions for local government plans that do not comply with GASBS 67/68 have been updated for the first phase of the implementation of GASBS 73. The pension notes and RSI templates for both state sponsored and local sponsored plans have been updated with 2016 information. The GAAP-basis pension illustration spreadsheet has been significantly updated for year two reporting including note disclosure examples, amortization tables, and reconciliation examples. This disclosure is required for fiscal years starting after December 15, 2015 (GASBS 77). Added validation checking each individual enterprise fund for reporting accounts 591, Debt Repayment and 594, Capital Expenses as indicated in these accounts description. Both accounts should be reported even if the dollar amounts are $0. Section 4.8.1.25 adds balance sheet/statement of net position minimum variance requirements within $1,000. Validation tests each reporting fund. The following accounts were added to accommodate the accounting for pension: 193.50 [Pension Asset], 198.40 [Deferred Outflows: Pension], 264 [Pension Obligation (Net)], 271.80 [Deferred Inflows: Pension]. Reminder: the BARS numbering system in the general ledger is optional. The above codes are for informational purposes only. The new revenue/expenditure/expense chart of accounts is an interactive application. To see accounts applicable to your government choose an appropriate government type. The accounts 30810/50810 [Beginning/Ending Reserved Fund Balance (GAAP)] were changed to 30819/50819 [Beginning/Ending Restricted Net Position]. The accounts 30880/50880 [Beginning/Ending Unreserved Fund Balance (GAAP)] were changed to 30889/50889 [Beginning/Ending Unrestricted Net Position]. The account Net Investment in Capital Assets was added. were added for GAAP reporting governments. This section discusses the new accounting and reporting requirements for single-employer and state sponsored pension plans mandated by GASBS 68. It also contains links to Excel spreadsheets containing instructions and examples of calculation of pension liabilities. This new section provides detailed guidelines for reporting property tax according to GASBS 65. The Financial Reporting Entity Flowchart (and accompanying notes) was updated to include relationships other the component units that would have an effect on reporting entity. The GAAP criteria for reporting of component units and other types of relationships did not change; however the new chart will better reflect the existing reporting requirements. There are no substantive changes in proprietary funds reporting. This section was reformatted to accommodate the inclusion of the stand-alone reporting guidance for ports, transits, PUDs, housing authorities, risk pools, hospital, water, sewer and irrigation districts. Sections 4.7.260-.330 were replaced with new (GASBS 68) reporting requirements for pensions. The new sections contain links to Excel spreadsheets with examples of required schedules. The notes contain requirements for all different types of local governments. Some notes are applicable to all or most local governments. However some are unique to a very specific type of government. It’s the government responsibility to choose all applicable and necessary disclosures. The new paragraph regarding pension plan policy was added (E.10). Other than this addition, there are no substantive changes in this disclosure. This note was reformatted to accommodate the inclusion of the stand-alone reporting guidance for ports, transits, PUDs, housing authorities, risk pools, hospital, water, sewer and irrigation districts. The note was expanded to incorporate (if applicable) disclosures regarding loans with forgiveness clauses and grants with recoverable clauses. The note was updated to meet the GASBS 68 requirements. It contains links to the WORD version. Local governments completing the Schedule 01 for fiscal years ended on or after December 31, 2015 must ensure the data submitted is accurate. The online filing system will calculate ending fund balances/net position using government-submitted information. If the SAO calculated ending balances/net position result in a variance from the local government’s submitted ending balances of greater than $1,000, the local government will not be able to submit its annual report until corrected. The new paragraphs describe when the entity should start depreciating an asset. Added new section discussing financial guarantees (GASBS 70). Imprest, petty cash and change funds are not budgeted because they represent working capital for expenditures that are properly budgeted in other funds. The authorized balance of imprest, petty cash and change funds should be reported as cash in the general ledger. Expenditures should be recorded when such funds are replenished to their authorized balance. The authorized balance should be reported as cash in the financial statements. All funds should be reconciled and replenished to the authorized balance as of fiscal year end to ensure expenditures are recorded. Added reminder that the offsetting transactions for reimbursements should be done on an object level. Added new section with additional resources. The new section provides an overview of the transportation benefit districts and the accounting and reporting requirements. Added requirement to report any corrections made to already submitted financial statements. The section discusses advantages and disadvantages of GAAP or cash basis reporting. This information was previously available on the SAO web site and now is incorporated into BARS manual. Added reminder for the disclosure of component units to provide sufficient detail to clarify the specific criteria under the GASBS 61 used to justify the inclusion of each individual component unit including both fiscal dependence and the ongoing relationship of financial benefit or burden. For blended component units, clearly state the blending criteria under the GASB Statement 61. Updated first column; removed references to unamortized amounts; added lines for premiums and discounts; added pension to OPEB obligations; similar changes were made for business-type activities; also; a row for claims was added. The footnote with examples of claims was added. This note was incorporated into Note X-Construction and Other Significant Commitments. The note was expanded to include other commitments; the title was adjusted to reflect new content. The note was added to the housing authorities, hospital and water, sewer and irrigation districts reporting requirements. Added link to information in GAAP manual for defined benefit plans. This is not a new requirement; however the note was listed only in the housing authority section of the manual. The note is now available for all GAAP governments. Removed the note (GASBS 65, paragraph 29). The most common disclosures were made into separate notes and only very rare transactions are disclosed here. The note has a new title Unique and Unusual Transactions. Added sample note disclosures for housing authorities (HARRP).